We have some new knits at Treadle with a thick, plush, autumnal feel. These two striped sweater knits feel soft and plush in the hand, just right for cool-weather coziness. We also have some quilted knits, deliciously textured with faux-cable patterns. The cover of the current Sew Stylish magazine has a dress sewn in just this style of knit fabric. So fetching! You can get all these knits and more (and your copy of Sew Stylish magazine!) at Treadle Yard Goods. Treadle will be open regular hours for Labor Day weekend: Saturday 10-5, Sunday 1-5. We will be closed on Monday in observance of Labor Day. The wool we have coming into the store right now is just stunning! Our fabric tables are overflowing with luscious colors and textures. Here's a peek at just a little of our current selection. There is so much more in our store, and so much more is on its way! Start planning your autumn wardrobe now, and make a new wool jacket or coat for your first piece. This one is too good not to share! We have this hilarious new print in the store, based on the iconic "Keep Calm and Carry On" posters, but with a sewing theme. Check it out! We have a whole bunch of new fabrics from Kokka, purveyor of whimsical Japanese prints. The style has similar modern twists to sister brand Echino, but much cuter! Woodland creatures, dinosaurs, polka dots, and florals are featured on these heavyweight cottons, perfect for small-scale crafts like wallets and bags. We have a wonderful new book at Treadle, Me & My Sewing Adventure, the follow up to the popular Me & My Sewing Machine. This book covers SO MUCH, from pressing basics to handsewing stitches, tons of different seam and edge finishes, how to make your own fabric- and thread-covered buttons, plus embellishments, patchwork, and so much more! It's the perfect guide for advanced beginners looking to broaden their skill base. It would also be an excellent reference for advanced sewists! We have a well-curated book selection at Treadle, filled with the best titles for sewing resources and techniques. Come find a book to inspire you today! We have a charming new collection of prints from designer Heather Ross. She has brought her sweet style to the world of fairy tales with the Far Far Away collection. The Princess and the Pea is the centerpiece of the collection.Standing high atop her pile of mattresses, she just can't seem to get a good night's sleep with that pesky bump bothering her. Look closely and you will spot the pea in the print! She is joined by fabrics featuring unicorns, frogs, and soft florals. Beautiful wools are pouring into Treadle! Here is a group of pieces that really caught our eyes because of their bright, saturated colors. Woven of soft worsted wool with a lightly napped surface, these wools would be ideal for skirts, trousers, or lightweight jackets. Bring some color into your cold-weather wardrobe! It's so exciting when we get project panels in the store. So much of the work is already done for you, and you can just enjoy the sewing! These two apron panels are what every kitchen needs. The fruit apron makes me think of canning late-summer jams and preserves, while the bird wreath has a beautifully autumnal feel. Each of these panels includes beautifully detailed pieces for the apron body, straps, and pockets, as well as instructions. Just cut along the lines and go! We have a delightful new group of printed linen/cotton fabrics from Moda's Avant Garden collection. These densely-packed florals and mod graphics are printed on natural unbleached linen. The undyed color, with deep warm brown, gives a calm neutral canvas to help blend the saturated bright shades of turquoise, cherry red, lime, and pink. This fabric is a heavier weight, perfect for bags, purses, and crafts. These prints would make great pillows or upholstery covers! For garments, keep the sewing simple and slightly fitted - think denim styling - to maintain a smooth line and take advantage of the fabric's weight. We also have several coordinating prints from the group in cotton broadcloth. Come take a look! Autumn looks are trickling into the store. These beautiful, densely-packed florals have a warm, late summer vibe, verging on autumnal. It may still be summer, but autumn is just around the corner. 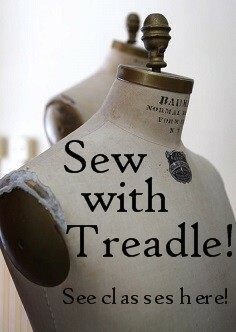 Be ready with seasonal sewing - Treadle is full of ideas to get you stitching!